Fakhr al-Dīn Ridhwān ibn Rustam al-Sā'ātī (d. between 618-626 H/1220-1229 CE) was a scholar and mechanical engineer, author of the book ‘Ilm al-sā'āt wa 'l-'amal bihā in which he described the famous public clock set in Damascus by his father. We present hereafter a short outline of his biography, extracted from the data provided by different historical sources that included entries on him. This article was translated from Arabic by Haya Zedan (FSTC). A thorough revision and copy editing was performed by the editorial board of www.MuslimHeritage.com. The complete name of our scholar is: Fakhr-ul Dīn Ridhwān bin Muhammad bin Alī bin Rustam bin Hurduz Al-Khurasānī Al-Sā'ātī. This long name is contracted in historical sources to a shorter one: Fakhr al-Dīn Ridhwān b. Muhammad b. Alī b. Rustam Al-Sācātī. He was born and raised in Damascus, where he died. As well as a scholar and scientist, he was an astronomer, a mechanician (especially as a clockmaker, from which he gained his title as-Sā'ātī), a physician, a writer and poet, a musician, a politician and a calligrapher. His Father, Muhammad Al-Sā'ātī, is originally from Khurasan. He moved to Damascus and lived there until he died around the year 572 H. He was referred to in historical literature as an engineer. He created the clock on Jīrūn gate (Bāb Jīrūn), famous as the gate of the clocks, located east of the Umayyad Mosque in Damascus, between the years 1154 and 1174 CE, in the time of al-Malik al-'ādil [the Just King] Nūr Al-Dīn Mahmūd bin Zingī in Damascus (died Shawwal 569 AH/ May 1184 CE). Muhammad Al-Sā'ātī was described by Al-Safadī and Ibn Abī Usaybi'a as unique in his knowledge of clock-making and astronomy. 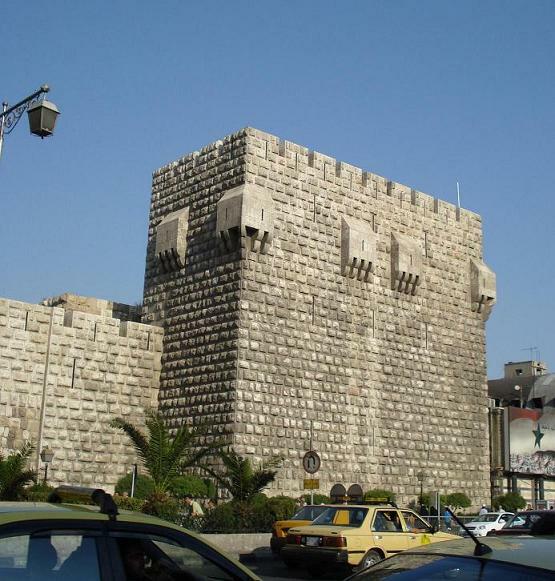 Figure 1a: View of Damascus Citadel located in the northwest corner of the Old City. (Photography in the public domain). Figure 1b: The foundation inscription of the Citadel of Damascus with the name of al-'Adl the brother of Salahaddin. (Source). Fakhr 'l-Dīn's brother, Bahā Al-Dīn Abū Al-Hasan Alī, known also as Ibn Al-Sā'ātī, was born in Damascus and died in Cairo in 604 AH/1207 CE. He was a famous poet, and was spoken of by Ibn Abī Usaybi'a as follows: "He was the best of his time in poetry, and has no equal". His work was published in Beirut in 1938-1939. 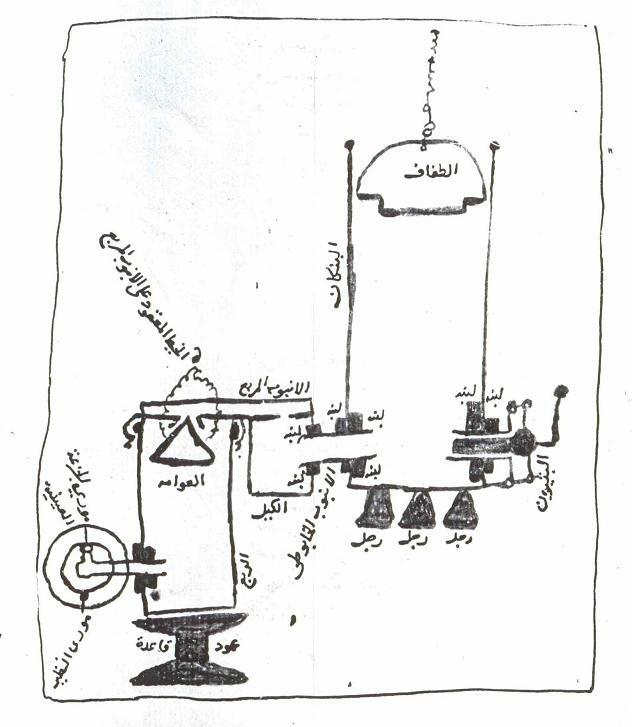 Figure 2: Diagram of Ridhwān al-Sā'āti's clock as depicted in the original manuscript of his book ‘Ilm al-sā'āt wa 'l-'amal bihā. (Source: J. Shawqī, Al-'ulūm wa 'l-ma'ārif al-handasiyya fī al-hadhāra al-islāmiya, Kuwait, 1995, p. 297). Ridhwān grew up in a house of knowledge, for he was raised by his father, the renowned creator and engineer. From him he learned astronomy and the science of mechanics- clock-making, and he learned the medical profession from Fakhr 'l-Dīn Muhammad Ibn Abdu-s-Salām Al-Mārdīnī (512-594 AH/ 1118-1198 CE), and from Abū Al-Hajjāj Radī 'l-Dīn Yūsuf Ibn Haydara Ibn Al-Hasan Al-Rahabī (534-631 AH- 1140-1233 CE). Ridhwān remained to learn with Abū Al-Hajjāj for some time, and was apt and intelligent, excelling at what he pursued, diligent in his learning. This was confirmed by Al-Safadī and Ibn Abī Usaybi'a. Ridhwān studied literature under Abū Al-Yamn Tāj al-Dīn Zayd Ibn al-Hasan al-Kindī (520-613 H/1126-1217CE). Ridhwān's upbringing and learning is reflected in his work and scientific achievements. Ridhwān worked in the palace of the King Al-Fā'iz Ibrāhim (the nephew of Salāh 'l-Dīn al-Ayūbī) and the son of the Just King Sayf 'l-Dīn Abū Bakr Ahmad. He then served the Great King Sharaf al-Dīn ‘īssā, son of the Just King (died 624 AH/1227 CE) in a medical capacity, and held a ministerial role as well, which exemplifies Ridhwān's political knowledge and capabilities, and his aptitude at medicine. There are no records of Ridhwān's birth, and sources vary on his exact date of death. Yāqut al-Hamawī in his book Mu'jam al-Udabā' lists Ridhwān's death in the year 618 H. Al-Ziriklī followed suit in his book Al-A'alām, and Ismā'īl al-Baghdādī in Hadiyat Al-'āarifīn and acknowledged Ridhwān's death in the year 620 H. This was also reiterated in Mu'jam Al-Mu'alifīn and with Humaydān in A'lām 'l-hadhāra. Ibn Abī Usaybi'a in his book ‘Uyūn Al-'anbā' and al-Safadī in his book Al-Wāfī bi'l-wafayāt declined to state a date for Ridhwān's death, saying only that Ridhwān died in Damascus of jaundice. Other sources have listed dates that are incorrect (627 H /1230-1231 CE), and the reason is that Yāqūt himself defines the date of Ridhwān's death, but Yāqūt died in 626 H / 1229 CE. This confirms that Ridhwān died before Yāqūt, between the years of 618-626 H / 1221-1229 CE. Figure 3: Diagram of Ridhwān's clock from a manuscript copy of his treatise. Ridhwān finished a book in Muharram 600 H/September-October 1203 CE on the science of clock-making titled: Kitāb ‘ilm al-sā'āt wa 'l-'amal bihā (The Science of clocks and working with them), in five chapters. The book is devoted to the description of clock machinery, the working of the device, shapes of its different parts, sizes, and how to work with them. He included illustrations of the machines and how they operate, as well as recommendations for their daily use, and problems that may occur, and how to avoid these to maintain a fully functional machine. Ridhwān's knowledge of clock-making indicates his knowledge of astronomy as well, and this is because of the strong relation between the two subjects in that time. Ridhwān's book was published by Muhammad Ahmad Dahmān in Damascus in 1401 H /1981 CE, and was translated by Wiedeman and Hauser into German, a short translation dependant on the manuscript 1348 preserved in Forschungsbibliothek in Gotha in Germany. The treatise is considered to be a move in a new direction for educational texts as far as organization and segmentation . 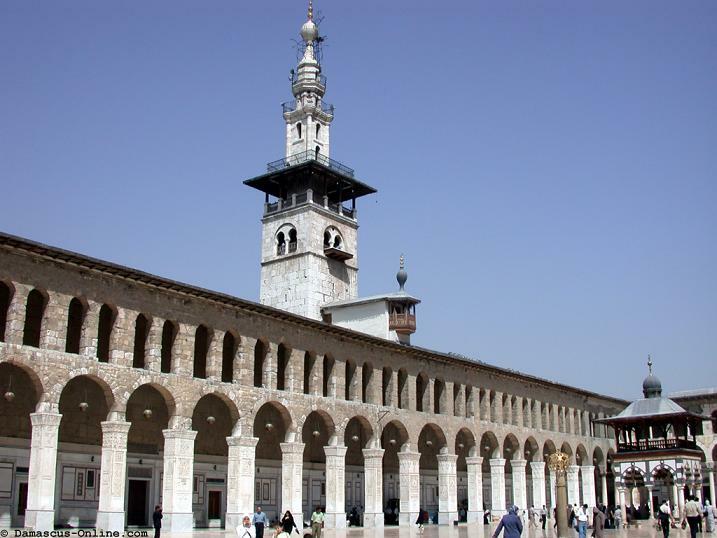 Figure 4: A view from the courtyard of the Umayyad Mosque in Damascus where Ridhwān's clock was erected. (Source). Most of the sources and references point to Ridhwān's medical aptitude, which made him Royal Physician to the two brother kings Al-Fā'iz and Al-Mu'azzam. He was complimented in Al-Safadī's book Al-Wafī by saying: "he was a physician complete and dignified in medicine and literature, and he was fond of the words of Sheikh Ibn Sīnā and fascinated by it." Ridhwān is the author of the following two medical texts: A completion of the book Colinge by Ibn Sīnā, and Al-Hawāshī (marginalia) based on Al-Qanūn by the same Ibn Sīnā. Furthermore, he was knowledgeable in music and was adept at playing the ‘ud (luth). Yāqūt al-Hamawī reported that he attended gatherings with Ridhwān in Damascus where he played more than once. In conclusion, we may say that Ridhwān b. Muhammad Al-Sā'ātī's scholarly achievements embodied science, art and literature, and he was a distinctive personality that held prestigious positions in his society. Baghdādī, al-, Ismā'īl, Hidāyat al-'ārifīn fī asmā' al-mu'allifīn wa-'l-musannifīn. Baghdad: Maktabat al-muthanā, no date, vol. 1, p. 369. Brockelmann, Carl, Geschichte der Arabischen Litteratur. Leiden: E.J.Brill, vol. 1, 1943, p. 625; Supplement I, 1937, p. 866. Hajjī Khalīfa, Mustafā b. ‘Abd-Allāh, Kashf al-zunūn ‘an-asāmī 'l-kutub wa-'l-funūn, Baghdad: Maktabat al-muthanā, no date, vol. 2, p. 1451. Hill, Donald R., Arabic Water Clocks. Aleppo: Institute for the History of Arabic Science, University of Aleppo, 1981, pp. 69-88. Ibn abī 'Usaybi'a, Muwaffaq al-Dīn, ‘Uyūn al-'anbā' fī tabaqāt al-atibbā', edited by Nizār Ridhā. Beirut: Dār al-hayāt, 1965, pp. 402-403, 661-662, 672-675. Ibn Jubayr, Muhammad ibn Ahmad, Rihlat ibn Jubayr, edited by Husayn Nassār. Cairo: Maktabat Masr, 1955, pp. 258-259. Jazarī, al-, Abū 'l-'Iz Ismā'īl, Al-Jāmi' bayna al-'ilm wa 'l-'amal al-nāfi' fī sinā'at al-hiyal. Aleppo: Institute for the history of Arabic science, 1979, p. 51. Kahhāla, 'Umar Ridhā, Mu'jam al-mu'allifīn: Tarājim musannifī al-kutub al-'arabiya. Damascus, 1377 H/1957, vol. 3, p. 189; vol. 4, p. 166; vol. 10, p. 170, vol. 13, p. 295. Leclerc, Lucien, Histoire de la Médecine Arabe. Paris: Ernest Leroux, 1876, vol. 2, p.159. Nu'aimī, al-, 'Abdulqāder b. Muhammad, Al-Dāris fī tārikh al-madāris, edited by Ja'far al-Hassanī. Damascus: Al-Majma' al-'ilmi al-'arabī, 1951, p. 388. Ridhwān, Fakhr al-Dīn ibn Muhammad al-Sā'ātī, ‘Ilm al-sā'āt wa-'l-'amal bihā, edited by Muhammad Ahmad Dahmān. Damascus, 1981, pp. 56-57, 60-62, 74-75. Rosenfeld, Boris A., & Ihsanoglu, Ekmeledin, Mathematicians, Astronomers & other Scholars of Islamic Civilization and their Works (7th-19th Centuries). Istanbul: Research Center for Islamic History, Art and Culture, 2003, p. 201. Ruska, Julius, "Al-Sā'a", Dā'irat al-Ma'ārif al-Islāmiya. Cairo, 1933, vol. 11, pp. 56-57. Safadī, al-, Salāh al-Dīn Khalīl ibn Aybak, Kitāb al-wāfī bi-'l-wafayāt, edited by Ahmad al-Arna'ūt and Turkī Mustafā. Beirut: Dār 'ihyā' al-turāth al-'arabī, 1420/2000, pp. 86-87. Sarton, George, Introduction to the History of Science. Huntington & New York: Robert E. Krieger publishing company, vol. 2, 1975, pp. 631-632. Sbānū, Ahmad Ghassān, Mamlakat Hamāt al-'ayyūbiya. Damascus: Dār Qutayba, 1984, pp. 199-200. Sheshen, Ramadhan, Izki, Jawad, Akbikar, Jamil, Catalogue of Manuscripts in the Koprulu Library. Istanbul: IRCICA, 1406/1986, pp. 482-483. Suter, H., Die Mathematiker und Astronomen der Araber und ihre Werke. Leipzig: Druck und Verlag Von B. G. Teubner, 1900, pp. 136-137, 218. Suter, Heinrich, "Ibn al-Sā'ātī", Dā'irat al-Ma'āarif al-Islāmiya. Cairo, 2nd edition, 1969, pp. 305-306. Suter, Heinrich, " Ibn Al- Sā'ātī" Encyclopédie de l Islam, New edition. Leyden / Paris: Brill, Maisonneuve / Larose, 1975, vol. 3, p. 945. Taqqūsh, Muhammad Suhayl, Tārīkh al-'ayyūbiyīn fī misr wa-bilād al-shām wa-'iqlīm al-jazīra (569-661 H/1174-1263). Beirut: Dār al-nafā'is, 1999, pp. 56, 206, 229-230, 239, 245-246, 299, 326. Taqqūsh, M. S., Tārikh al-Zinkiyyīn fī 'l-mawsil wa-bilād al-shām (521-630 H/1127-1233). Beirut: Dār al-nafā'is, 1999, pp. 11, 195, 201, 287, 439. Wiedemann, Eilhard, und Hauser, Franz, "Über die Uhren in Bereich der Islamischen Kultur", Nova Acta Abh. der Kaiserl. Leop . Deutschen Akad. der Naturforscher 100 (Halle 1915) .PP.1- 272. Yāqūt al-Hamawī, Mu'jam al-'udab'ā, Dār al-ma'mūn, no date, vol. 11, pp. 141-142. Zahir, Hamīdaan, A'lām al-hadhāra al-'arabiya fī 'l-'ulūm al-'asāsiya wa-'tatbīqiya. Damascus: Publications of the Ministry of Culture, 1996, vol. 3, pp. 238-243. Zambauer, Edward von, Mu'jam al-ansāb wa-'l-usrāt al-hākima fī al-tārikh al-islāmī. Beirut: Dār al-rā'id al-islāmī, 1980, pp. 150-152. Zaydān, Jorjī, Tārikh 'ādaab al-lugha al-'arabiya. Beirut: Maktabat al-hayāt, 2nd edition, 1978, vol. 3, p. 21. Ziriklī, al-, Khayr al-Dīn, Al-A'lām, no date, 3rd edition, vol. 3, p. 53. See Abdel Aziz al-Jaraki (2007), When Ridhwan al-Sa'ati Anteceded Big Ben by More than Six Centuries. * Dean of the Institute for the History of Arabic Science, Aleppo University, Syria.